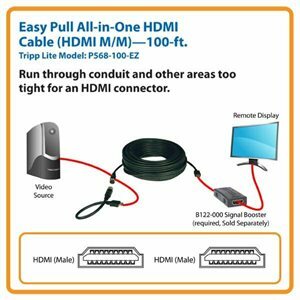 Tripp Lite's 30.5 m (100-ft.) Standard Speed HDMI Easy Pull All-in-One Monitor Cable makes running long length video cables a snap. The pull-apart design allows the cable to be run through conduit or other tight areas that a HDMI connector wouldn't fit through. Diameter of the circular DIN end is only 7/8". Circular Easy Pull connector is threaded to ensure maximum security once the cable is reattached. Supports iPad2 Video Mirroring when used with Apple Digital AV Adapter. HDMI assures that the best audio/video signal is always sent from the source (HDTV signal, Blu-Ray Player) to the display (Projection Television, LCD, Plasma, etc.). It does this by allowing uncompressed video and multi-channel audio data to be input to the display device through a single cable. An HDMI connection allows input at high rates of speed, up to 10.2 Gbps. In most applications, a signal booster (B122-000-60) will need to be used with this cable to ensure a signal strong enough for your display. The Tripp Lite P568-100-EZ 100 ft. Standard-Speed Easy Pull HDMI Cable (M/M) is ideal for digital signage, video presentations, point-of-sale displays, classrooms and other applications that display high-resolution video and multi-channel audio. It connects HDMI-enabled source devices, such as computers and Blu-ray players, to HDMI-enabled displays, such as monitors, projectors and high-definition TVs. Note: Most applications will require a B122-000-60 (sold separately) signal booster to operate optimally. This cable supports Ultra High Definition (UHD) 4K x 2K video resolutions up to 3840 x 2160, including full 1080p, and up to 10.2 Gbps of bandwidth capacity. The P568-100-EZ pulls apart into two pieces to make it easier to run through conduit or other tight areas where standard HDMI connectors won’t fit. The threaded circular DIN connectors are less than one inch in diameter and secure tightly after installation. The 100-foot molded 28 AWG cable features premium foil and braid shielding, as well as paired video wire construction, to deliver top-of-the-line signal quality and protection from EMI/RFI interference. Gold-plated HDMI connectors with gold-plated copper contacts ensure excellent conductivity. Integral strain relief ensures the cable and connectors last a long time. The P568-100-EZ comes with a lifetime warranty. It’s manufactured in compliance with strict RoHS specifications, reflecting Tripp Lite’s commitment to environmental responsibility. Your Tripp Lite cable will be shipped to you in its original Tripp Lite packaging (poly bag with Tripp Lite logo; see photo). This is your assurance that the cable you purchase will deliver the superior performance you expect. If you don’t see this packaging, it’s not a genuine Tripp Lite cable.